#TT: Antarctica, Shackleton & Penguins. I do not work for G Adventures, and I am not being compensated in any way for this post. I have always loved the company; in the past I have sent many clients on trips with them and every single person came back raving about how amazing they are, so I feel confident recommending them to pretty much everyone. Everyone has a travel dream, and they all vary widely based on who you talk to. My mom is very content to spend her annual summer vacation on a floatie in the Okanagan Valley in B.C, for example. I, however, did not receive the same want for simplicity. I have much more complicated travel dreams--spin a globe, randomly jab a finger on a location, and that will be one of the many places that I want to travel. I could spend every day of the rest of my life wandering the world, and I still won't see everything on my list. This is one of the downsides of working in travel--you see amazing vacations to so many places that your must-travel list continues to grow, even if you cross places off your list as you go. I do have that one travel dream, though. That one trip that I would take as my final, never-leaving-Edmonton-again trip. The end-all, be-all experience that could never be topped, no matter how hard you try. For me, that trip of all trips would be Antarctica. 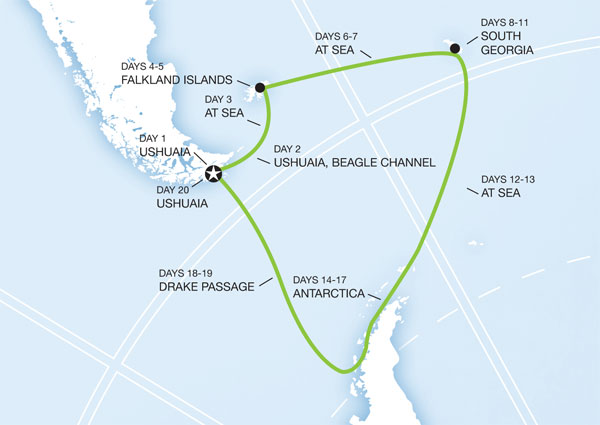 More specifically, my dream trip is Spirit of Shackleton, a trip that is offered exclusively by G Adventures. I have read pretty much every biography about Ernest Shackleton, as well as seeing the IMAX movie more times than I can count. His journey has always fascinated me, and the idea of actually retracing his steps (safely, of course!) just blows my mind. The only way I could get more excited to retrace the steps of an explorer would be to put me on the Enterprise so that I could relive all seven seasons of The Next Generation, but I'm fairly confident that this will not be possible in my lifetime. So Shackleton it is! There are a few things that make me nervous about this trip. I don't get seasick but it takes a long time for me to get my "sea legs", so I would be covered in bruises from falling by the time we actually got to the Falkland Islands. Also, that's a long time to be staying in a cabin on an expedition ship--even if you spring for the Category 5 Double. The last obstacle is quite obviously the price: a cool $17,000CAD for the tour (in the cheap Category 1 cabin, ew), including optional kayaking, Canada Goose jacket, and camping on the Antarctic peninsula--before flights, pre-tour activities (I couldn't go to Ushuaia without staying for a few days, and when you're that close to Patagonia how do you pass up hiking Torres del Paine??). That is the double price, too, so I'd have to find someone just as crazy as I am to go with, lest I want to spend the additional $10,000CAD for my own room. So, this is a pipe-dream for me, clearly. But it is one that I will dream of until either the day that I go or the day that I die, whichever happens first. Where do you dream of traveling to? Movin' On Up...with a professional, not made in Paint design!